The results are in from the Texas primary elections on March 6, 2018, the first since President Donald Trump was elected. Check out county-by-county comparisons of turnout in a few key races. A surge in Democratic voters. Strong support for female candidates. The departure of eight sitting state lawmakers. The results are in from the March 6, 2018, Texas primary elections, the first in the nation since President Donald Trump was elected. Here are county-by-county comparisons of turnout in a few key races. Gov. Greg Abbott — the most popular statewide elected official — easily beat two Republican challengers with 90.4 percent of the Republican vote. Come November, Abbott will face off against either Lupe Valdez, the former Dallas County sheriff, or Andrew White, the son of late Texas Gov. Mark White. Though the Democratic frontrunners will square off in a May runoff, both face long odds of beating Abbott and the $41 million campaign war chest he has amassed. Valdez took 42.9 percent of the vote and won several counties in the western part of the state and in the Dallas-Fort Worth area. White, a Houston native, garnered 27.4 percent of the vote, largely in counties surrounding his hometown. U.S. Rep. Beto O'Rourke of El Paso won the Democratic nomination for U.S. Senate with 61.8 percent of the vote and will face off against incumbent Ted Cruz, a Republican, in the fall. 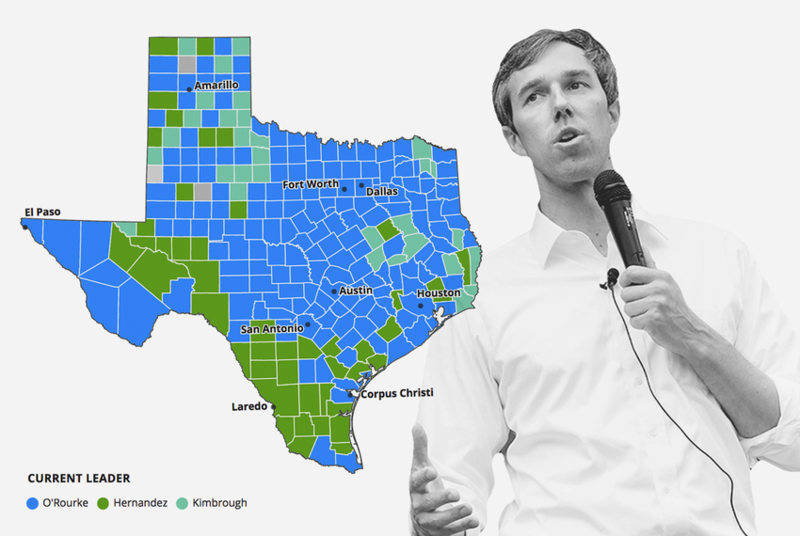 But despite O’Rourke’s aggressive campaigning and fundraising, he lost several border counties to a lesser-known primary challenger, Sema Hernandez, who received about 24 percent of the vote. The geographic pattern is evocative of former state Sen. Wendy Davis’ primary performance on the border in 2014, during her bid for governor. Though Davis won the nomination handily, she lost by a wide margin to Abbott in the general election that year, and some political observers wondered if her shortcomings in border counties presaged her loss in the general. Republican Agriculture Commissioner Sid Miller — known for his bombastic social media presence, dislike of Nutella and signature cowboy hat — beat out two challengers to avoid a runoff Tuesday. Trey Blocker, who’d been considered the more serious of Miller's two challengers, was bested by Jim Hogan by about 20,000 votes. Hogan, who ran for the seat as a Democrat last time around, won several counties around Laredo — including Webb, Starr and Cameron. Despite a rollicking primary campaign season, incumbent George P. Bush won the GOP primary Tuesday night, avoiding a runoff against his predecessor, Jerry Patterson. Bush, the scion of a political dynasty, won nearly 58 percent of the vote – and almost every county – while Patterson took about 30 percent. Patterson beat Bush and two other candidates, who each took less than 10 percent of the vote, in only Presidio and Duval counties. Patterson, in a statement, said: "While I didn't win, Texas did. As a result of our campaign, there is finally at least some transparency at the Alamo, and there are Harvey victims who now have shelter. Neither would've happened without being made an issue in this campaign." Bush will face off against Democrat Miguel Suazo, who took 70 percent of his primary vote, in the general election. Disclosure: Trey Blocker and Jerry Patterson have been financial supporters of The Texas Tribune, a nonprofit, nonpartisan news organization that is funded in part by donations from members, foundations and corporate sponsors. Financial supporters play no role in the Tribune's journalism. Find a complete list of them here.